John Hesp's 2017 Main Event run is being given the Hollywood treatment. The improbable story of John Hesp, the eccentric Englishman that took the 2017 World Series of Poker Main Event by storm, is being given the Hollywood treatment. 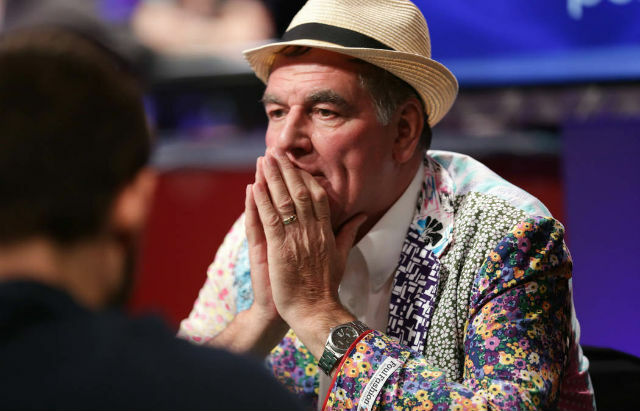 According to The Daily Mail, Hesp’s inspiring fourth place finish in the Main Event for $2.6 million dollars has been optioned by “two renowned movie producers.” This means that in the not-so-distant future Hesp’s trademark colorful coat will be able to be seen in actual technicolor. Fans who followed the Main Event in 2017 will be familiar with his story: a grandfather from East Yorkshire who had played poker about once a month for $10 went on the heater of a lifetime. Hesp battling some of the best young players the game has to offer and, in the process, he reminded a legion of poker players what it means to bring the fun back to the game of poker. With his fastidious flare and colorful wardrobe which matched his personality, it didn’t take long for word of his incredible run made it into the mainstream. Film producer Marc Ambrose knew that this was just the kind of feel good story that could transcend poker itself. For Hesp, he’s surprised at the interest. “I have been completely overwhelmed and humbled with the large number of people who have reached out to me from all parts of the world and told me how much they had enjoyed watching me on TV and how inspiring it was,” Hesp said. As for who will play Hesp in the movie, nothing is concrete but Hesp has an idea or two. While it’s unlikely that either of these actors have the chops to play the energetic Hesp, we would like to offer a few suggestions of fantasy casting for the upcoming movie. Here are some options for Ambrose as to who we think would make for a fantastic cast for the climatic WSOP Main Event Final Table scene. John Hesp as played by Michael Caine. Two-time Academy Award winner Michael Caine can likely capture Hesp’s English essence. WSOP Champ Scott Blumstein as played by young Seth Rogan. Sure, we may have to go back in time a few years, but Rogan’s jovial nature and charisma would suit the likable personality of the 2017 champ. Dan Ott as played by Keanu Reeves. The scruffy silent type, Keanu Reeves would jump at the chance to play the runner-up. Benjamin Pollak as played by Bobby Cannavale. Bobby Cannavale, the star of Martin Scorcese‘s HBO show Vinyl would be a perfect fit for third-place finisher Pollak. Antoine Saout as played by Bradley Cooper. Is there another actor in Hollywood that wears a backward hat as well as Bradley Cooper? Bryan Piccoli as played by Emile Hirsch. Emile Hirsch would use what he learned playing the lead in Into The Wild to navigate Piccoli’s Main Event journey. Damian Salas as played by Jon Stewart. C’mon, check this out! It’s perfect! Jack Sinclair as played by Daniel Radcliff. British wizard as played by a British wizard. Ben Lamb as played by Matt Damon. The return of Mike McDermott.